NVIDIA Stock Looks Cheap. It's Probably Not. The stars are no longer aligned for the graphics chip company. The unassailable growth story that has propelled shares of graphics chip company NVIDIA (NASDAQ:NVDA) to incredible gains over the past few years is starting to show some cracks. The stock has lost nearly 50% of its value in less than three months, the result of a stock market sell-off and guidance calling for a surprise revenue decline in the fourth quarter. NVIDIA now trades for around 20 times trailing-12-month earnings, the lowest multiple in years. Assuming NVIDIA quickly works through the inventory overhang causing the revenue decline and returns to solid growth, one could argue that the stock is cheap. But there's a problem with that argument. The past few years have been anything but normal for NVIDIA. A perfect storm of market share gains, the cryptocurrency bubble, and booming data center demand has pushed up not only NVIDIA's sales but also its margins. If NVIDIA can't sustain its margins as at least some of those tailwinds disappear, earnings could take a big hit. Analysts are already expecting no earnings growth in fiscal 2020; that could end up being overly optimistic. 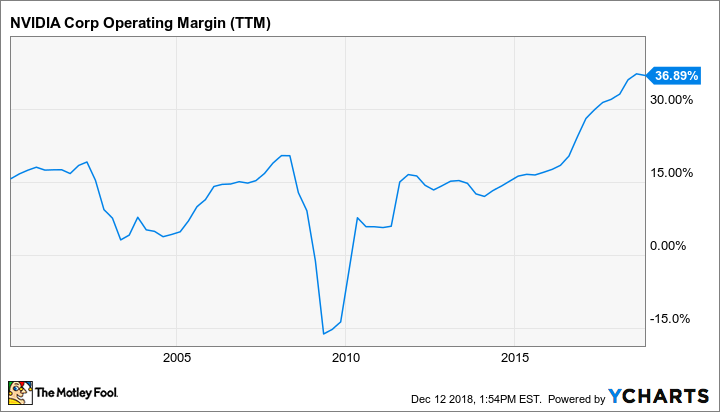 Over the past 12 months, NVIDIA has managed an operating margin of nearly 37%. That's more than double typical levels for the company. NVDA Operating Margin (TTM) data by YCharts. A few things drove this profitability explosion. First, NVIDIA's only competitor in the gaming graphics card market has been unable to compete at the high end of the market. The launch of NVIDIA's 900 series in 2014 kicked off a period of market share gains for the company at the expense of Advanced Micro Devices. AMD has gained back some ground, but its Vega high-end graphics cards largely fell short of NVIDIA's offerings. Second, the cryptocurrency bubble led to massive demand for graphics cards from cryptocurrency miners in 2017 and part of 2018. Jon Peddie Research estimates that more than 3 million graphics cards were sold to cryptocurrency miners in 2017. This demand pushed up prices and led both AMD and NVIDIA to increase production to keep up. Third, spending on graphics cards for data center applications, including artificial intelligence, has exploded in recent years. NVIDIA's data center segment grew by nearly 60% year over year in the third quarter. NVIDIA doesn't disclose per-segment profitability, but it's safe to say that sales of the company's ultra-expensive data center graphics cards carry high margins. Things are now changing for NVIDIA. The cryptocurrency bubble has burst -- bitcoin has lost nearly 80% of its value over the past year, and other digital coins have fared even worse. Demand from miners has disappeared. Both AMD and NVIDIA, underestimating how important cryptocurrency was to their businesses, are dealing with excess inventory that needs to be worked through. NVIDIA is expecting its total revenue to drop about 8% year over year in the fourth quarter, and the gaming segment will likely suffer an even steeper decline. The demand environment in the gaming segment hasn't been normal since sometime in 2017. It's not clear how fast this segment will grow or how profitable it will be once the inventory overhang is corrected, but it probably won't be as impressive as in the recent past. NVIDIA may have also planted the seeds of failure with its latest 20 series graphics cards. These cards feature some fancy ray-tracing hardware, but the performance gains for standard games are unimpressive, especially considering the lofty price tags. These cards don't have any real competition at the moment, but high prices open the door for AMD to make a comeback when it rolls out its next batch of high-end cards sometime next year. In the data center market, the explosive growth that NVIDIA has enjoyed won't last forever. That's partly because an eventual slowdown in data center spending, especially from cloud computing companies, is inevitable after years of rapid growth and partly because cloud computing companies like Alphabet's Google and Amazon are increasingly designing their own chips for artificial intelligence. That's not to say that NVIDIA's data center segment won't be a growth engine for the company. But 60% growth is unsustainable. There's a lot of room for NVIDIA's margins to fall, especially if something close to the worst-case scenario plays out in both the gaming and data center markets. That price-to-earnings ratio of 20 would become 40 or 50 at the current stock price if NVIDIA reverts to historical levels of profitability. That's probably overly pessimistic, but you get the picture. The 50% decline over the past few months has brought NVIDIA's valuation back to earth. But the stock is only cheap if you make some pretty optimistic assumptions.